Air21 vs. San Mig Coffee Game 1 Semifinals PBA Commissioner's Cup 2014: Date, Time, Live Stream, TV Info and Preview - Balita Boss! The Air 21 Express and San Mig Coffee Mixers will now enter in a best-of-five semifinal series in the 2014 Philippine Basketball Association (PBA) Commissioner’s Cup. Game 1 is set on Tuesday, April 29 at 8:00 p.m. Philippine Standard Time (PST) at the Mall of Asia Arena. It will be broadcast live on TV5. Live stream will be available via New5 Everywhere (TV5). The seventh-seeded Air21 Express completed upset of the second-seeded San Miguel Beermen with consecutive victories, 92-79 and 101-95 double overtime last Friday to enter into semis. This will be Air21’s first semifinals appearance in three years under the Shopinas franchise with Franz Pumaren as head coach. Asi Taulava made the buzzer-beating putback to send the game into overtime then hit two big baskets in the second overtime to complete the season’s biggest playoff setback. Import Wesley Witherspoon led the Express with 26 points. Sean Anthony and Taulava scored 18 and 16, respectively. Joseph Yeo, who was ejected in the second quarter after a flagrant 2 foul, contributed 11 points. Jonas Villanueva, Aldrech Ramos and Mac Cardona added eight points each. Meanwhile, the San Mig Coffee beat Alaska Aces in quarterfinals round 2-1 book their semifinals ticket. In their first quarterfinals match, Aces defeated Mixers 86-77. The San Mig defeated Alaska, 70-65, in Game 2. In Game 3, do-or-die game, San Mig Coffee knocked off defending champion Alaska, 79-65. The win marks the seventh straight time the San Mig Coffe Mixers has been to the conference semifinals under coach Tim Cone. Peter June Simon scored 21 points to lead the Mixers against Aces in Game 3. James Mays also helped the Mixers with 17 points and 24 rebounds. Mark Barroca added 14 points while Marc Pingris chipped in 10 markers. In the semifinals round, Witherspoon, Anthony, Taulava, Yeo and Cardona will try to lead the Express to a Commissioner’s Cup title. For the Mixers, the coaching staff will rely on their import Mays with local support coming from James Yap, Simon, Barroca and Pingris. 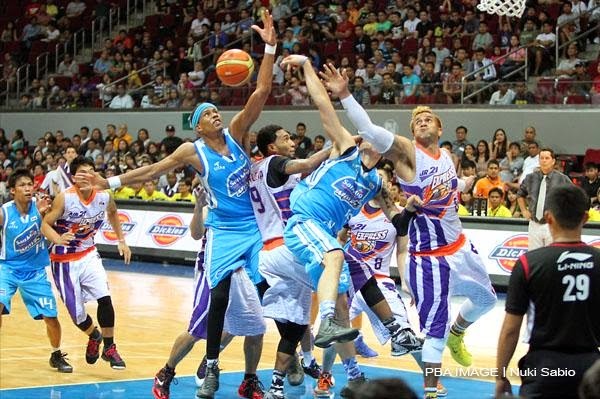 In the elimination round game, the Air21 Express lost to San Mig Coffee Mixers, 97-84, on April 9. Mays led the Mixers by scoring 23 points, grabbing 15 rebounds and blocking five shots. Simon finished with 20 points. Witherspoon finished the game with 27 points and 16 rebounds for the Express.